A story at StaceyPageOnline details how Grace College students are helping to not only preserve the history of the Winona Lake, Ind., community in which the school is located, but the history of the Fellowship of Grace Brethren Churches, as well. A portion of the story appears below. Click here to read the complete story. 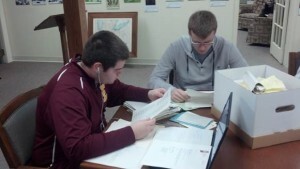 Grace College History majors, Caleb Day and Jeff Watkins, evaluate documents in the Reneker Museum of Winona History. History majors at Grace College are spending eight weeks during the spring semester working at the Reneker Museum of Winona History. The internships were designed to help students learn valuable professional skills and practical knowledge while helping support the fascinating heritage of the Winona Lake community. The program was offered as part of a class on Historical Preservation taught by Associate Professor of History, Dr. Jared Burkholder and counts toward a student’s applied learning credits. The students tasks include sifting through hundreds of documents and artifacts at the museum, located in Westminster Hall, cataloging what they find, and making decisions about sound storage and handling practices. The original mission of the Reneker museum, which was created in 1999 under the direction of Steve Grill and Carol Forbes, was to reach out to the community. This new effort is a continuation of this mission, and the materials will be preserved for researchers and future generations. It is also part of a larger effort by Grace College to improve its archival holdings, which also include materials related to the college and seminary as well as the Fellowship of Grace Brethren Churches.